The Book Finder first searches in the MERLIN catalog. Need to search for a book by keyword or topic? Search the MERLIN catalog. If no resources are found in MERLIN, the search moves to the MOBIUS catalog (a catalog of many Missouri libraries). 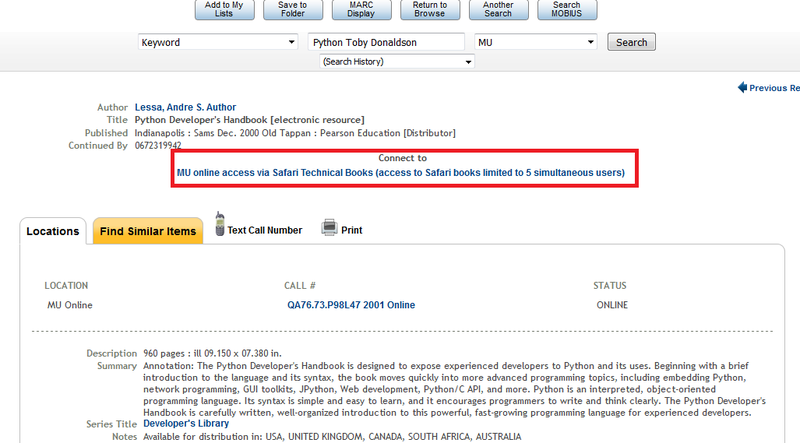 To connect to an eBook, search the title in MERLIN and select the "MU Online Access" hyperlink in the center of the page. Note: MU affiliates only have access to titles owned by MU. They cannot access books from UMKC, UMSL, etc.